the 305/1s had to be replaced with units from the LM region in the north-west.I'm afraid I don't remember which class they came from. They also had a slightly different livery, AIRI. The only AC units the LMR had in the early 1960s were the AM4s, which looked very similar to the AM5s, so it was probably them. Forty years later, towards the end of their working lives, ex-LMR 310s found their way onto the Great Eastern and Tilbury routes, but I doubt they worked the Chingford services. They also had a slightly different livery, AIRI. 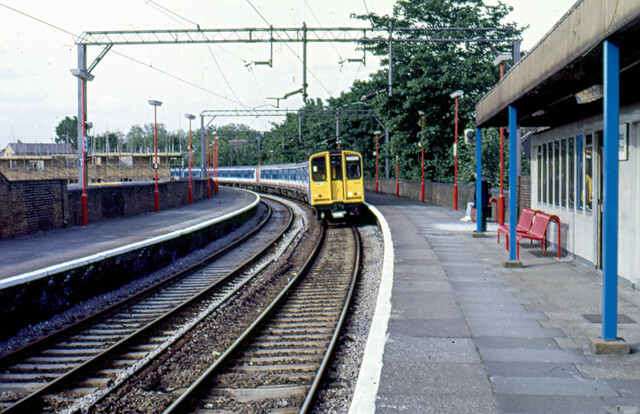 There was considerable disruption on the Chingford line when the 305/1s had to be replaced with units from the LM region in the north-west. According to Wikipedia this was not because of delays in production of the AM5s, but were a loan to cover for the AM6s and AM7s whilst they were being converted from DC to AC - the 304s having been built before they were needed on the LMR for precisely that reason. From what you say it seems that the AM4s were actually used on the Chingford line as well (or instead), possibly because the AM5s were better suited to the Shenfield/Southend route for some reason - maybe the AM4s couldn't work on the 6.25kV sections? These were a legacy of the smaller clearances needed for the old 1500V system, and a source of many of the issues with the transformers, which had to switch between the two supply voltages on the move - but sometimes didn't. A pity what is now the LMR has no spare units to help out this time - it has its own problems with delays in delivery of units both new (class 331) and converted (319Flex aka 769). Yes, I think this was documented in the Line 112 Group's "Railway to Walthamstow and Chingford" published some 50 years ago. I also seem to remember the AM4s mostly ran with the lavatories locked out of use (unwelcome to a small boy), and lavatories were not seen on the Chingford line till the 317s started helping out.. I thought the LMR (or rather, its successors) were actually to *blame* in the present situation, by demanding release of the 172s! I didn't know that - I had understood it was only the former 1500V dc lines which initially ran at the lower ac voltage, to save raising the clearances a second time. I've not too much to add in the way of history, but at the time the line was electrified and the 305s appeared I was a young pupil at Leyton County High School for Boys. The school playing fields were not in use so we all de-camped once a week to the wastes of the marshes on the Lea Bridge Road for our football, hockey or whatever. The new units tantalisingly passing just far enough away to prevent individual identification are well remembered, along with their steam predecessors. To get to the playing fields we were issued with free Bell punch tickets for the short journey from the Bakers Arms to Lea Bridge on trolleybus route 557. I developed a dodge which saw me saving my fare from school back home to Forest Gate on the 685/687 or 697/699 trolleybuses and use that money to catch a train from Lea Bridge into Stratford for a spotting session. The spare bus ticket from that would then be used to get to school the next morning. I don't know if my parents ever knew what I was up to, but I was never challenged! So in the end, what did the 315s replace on the Chingford branch? AM4/304, AM5/305, something else? I notice that the Wikipedia Class 315 article says they replaced 306s, but I assume this was only the GE mainline. 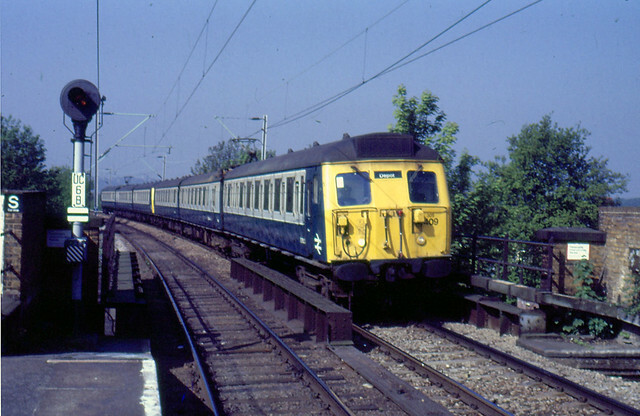 The 305/1s which operated the inner suburban Enfield and Chingford lines were indeed replaced by 315s. The outer suburban 305/2s, which had an extra carriage and some first class accomodation, and usually ran to Hertford and Bishops Stortford, were replaced, I believe, by 310s displaced from the LMR - some of them having a new lease of life replacing firstly 506s when Manchester/Glossop was converted to AC, and then on the newly-electrified North Berwick branch in Scotland. Some of the top-up order of similar AM8s ended up in West Yorkshire. Class 305s I believe. 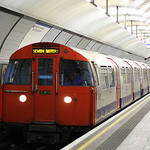 When I moved to London my first commuting experience was catching one of them into Liverpool St. It was like taking part in a TV sketch that I'd seen so many times on TV but had never experienced in my home city. Here's the only photo I have of one on the Chingford Line. And here is a NSE era class 315 on the line. I really should get some more LO era photos before they head for the scrap heap. What really improved the 305s was the duo-tone grey/blue livery. In olive green they were boring, and in rail blue, brash; but the 6-car train photographed by snoggle above looks elegant to me! I agree, the blue/grey is/was very smart. I have a few more pictures if they would be of interest. Good to read about my old train potting location when young(many years ago!) watched the wires going up and the odd dmu,s used for workings when line closed for wiring etc.First units were okay and seemed reliable did not realise they were midland region units just glad clean and reliable ,missed the old orderespecialy cabbing an N7 as it changed platforms! Any photos of current ops please? Not all the units were LMR. Just a few, presumably ekeing out the 305s as gremlins were sorted out. During the electrification process, I don't actually remember DMUs in use. It was mostly N7s and quints, but of course sometimes routed via Hall Farm Jc and Stratford. You were then apt to get N7s the wrong way round, till someone thought to reverse them on the triangles at Clapton-Coppermill etc. The DMUs were certainly used after 1960 when the juice was off; I can remember an 8-car DMU train (4 units, I suppose) leaving from platform 16 at LV one Sunday in October 1964...route via Stratford and the curve. Tank engines spend half their lives going bunker-first - why did it matter which way round they were? There speaks a man who grew up far from the GE! Whether an old wives tale or through scientific exploration, the N7s were always oriented "chimney towards Chingford", because it was held they pulled better up the 1 in 70 from LV that way round. I would image 'chimney first' is better when the line is predominantly uphill to maintain a better water level in the boiler. Given the size of railway gradients it's not really an issue (with perhaps the sole exception of the Snowdon Mountain Railway), 1 in 100 would give a drop of 1cm for every metre of boiler - so for a tank engine maybe an inch or two less in the gauge glass (yes, I know I'm mixing my measuring systems). Compare this to a road engine which has to go both up and down much steeper hills (but which aren't steep enough to deserve warning signs) and hopefully my point is illustrated.